At Jacksonville Complete Dentistry, we provide personalized dental plans for our patients with a focus on preventive care. That means we partner with patients to keep their smiles whole and healthy for life. When dental damage or decay can’t be avoided, we always use the most conservative treatments in order to preserve the maximum amount of healthy tooth structure. If you have a tooth or teeth that have damage or decay too extensive for repair with the most conservative tooth-colored fillings, a dental crown may be your best option. Dental crowns and crown supported bridges are two of the most commonly used restorations options. They allow us to maximize the strength of existing, healthy tooth structures in order to repair damaged smiles. If you need our help repairing dental damage, don’t wait for your next checkup. Give us a call right away. We’ll schedule an appointment to start repairing your smile as soon as possible. Why Choose Jacksonville Complete Dentistry for Dental Crowns & Bridges? A dental crown is a restoration that fits completely over the top of a damaged tooth to replace lost structure following decay or damage. When Will I Need a Dental Crown? 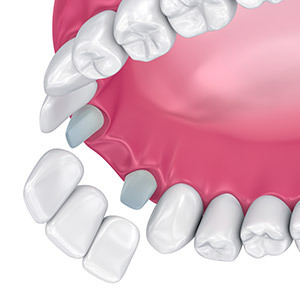 Fixed bridges are restorations crafted to replace one or more consecutive missing teeth. The prosthetic is created by fusing two dental crowns, one on each side, to a replacement tooth or teeth. 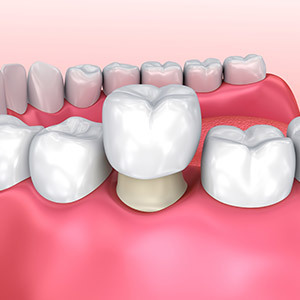 Then, the entire fixed bridge is cemented into place by attaching the dental crowns to teeth on either side of the missing tooth. How are Crowns & Bridges Placed? Both dental crowns and bridges are placed over the course of two appointments. During the initial visit, we prepare teeth by removing any damaged tissue. We will also need to remove a small amount of tooth enamel all the way around the tooth. This allows the dental crown to fit seamlessly into the natural smile line. Once teeth are prepared, impressions of the smile are captured. 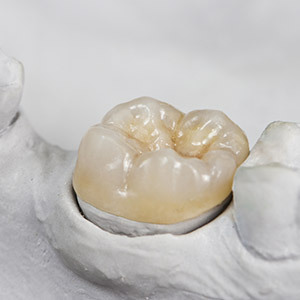 These impressions are used by dental labs to create your custom crown or bridge. To protect the prepared teeth while our lab crafts your final restoration, a temporary is placed. When we receive your final restoration, you’ll return to our office for your second visit. We remove the temporary and replace it with a custom dental crown or bridge. How Do I Care for My Crown & Bridge? 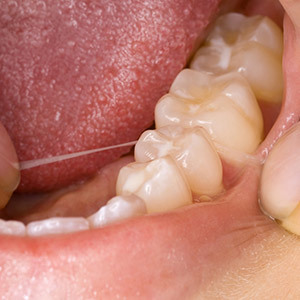 Following dental restorations, you will be able to resume your daily brushing and flossing routine. However, we may recommend that you change to a softer toothbrush or less abrasive toothpaste. We may also encourage you to use waxed floss, specialized flossing tools, or water flossers to ensure you can clean around your crown or bridge without pulling on the prosthetic. You will also need to visit our Jacksonville dental office at least twice each year for checkups and teeth cleanings. We’ll evaluate your restorations during these appointments, checking for signs of wear or damage. If you grind or clench your teeth at night, be sure to wear a nightguard as directed to avoid wearing down your crown or bridge. You should also use sportsguards as directed to protect your smile during athletic competition and practice.